Cancer cells often have aberrant numbers of chromosomes. Scientists from the German Cancer Research Center have now discovered a new mechanism that plays a role in these typical chromosomal aberrations. The new findings question the current concept of how cancer cells survive the chaos during cell division. This might also make it necessary to rethink specific treatment approaches that interfere with the distribution of chromosomes. When cells divide, the newly duplicated set of chromosomes is distributed evenly to the two newly forming daughter cells. This process is regulated by two polar bodies called centrosomes. Between the two centrosomes, protein fibers arise that appear like a spindle-shaped structure under the microscope. Along these fibers, one chromosome set each is pulled towards one of the poles. This normally ensures that each daughter cell is fully equipped. In cancer cells, however, scientists often observe higher or lower numbers of chromosomes than normal. This can be attributed to uneven distribution during cell division. One reason for this faulty distribution has been known for some time: Cancer cells often exhibit more than two centrosomes. 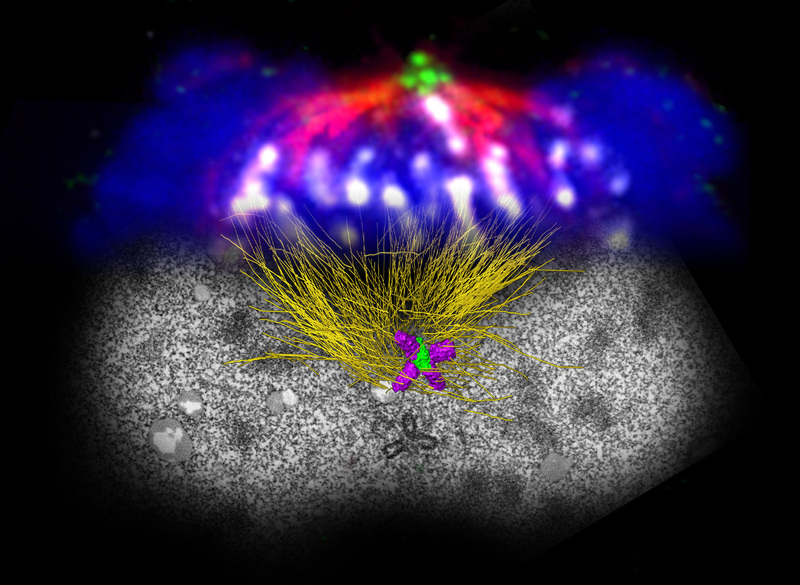 In order to avoid total chaos in cell division, the extra centrosomes often form clusters. This ensures, at least, that only two daughter cells form instead of several. However, the chromosomes can still be distributed aberrantly. “Up to now, we have assumed that clustering helps tumor cells survive,” said Alwin Krämer, who pursues research at the German Cancer Research Center (Deutsches Krebsforschungszentrum, DKFZ) and Heidelberg University Hospital. “But our investigations show that many of these cells die nevertheless.” Therefore, the cause of aberrations in the distribution of chromosomes in tumors must be sought earlier on. In collaboration with colleagues from the European Molecular Biology Laboratory (EMBL), Heidelberg, Krämer and his co-workers took a closer look at the replication of centrosomes. Every time a cell divides, the polar bodies must also duplicate in order to ensure that each daughter cell will later be equipped with two copies. Each centrosome normally consists of two centrioles, cylindrical protein structures that form a kind of centerpiece. After every cell division, only one new daughter centriole forms at each centriole, resulting in the formation of two new polar bodies in both daughter cells. Krämer and his co-workers discovered that many things can already go wrong in this step. Experiments in the Petri dish showed that cancer cells frequently form not only one daughter centriole but a couple of them. “This lays the foundation for the formation of more than two centrosomes in the next cell division,” explains Krämer. “In addition, if the two polar bodies contain different numbers of centrioles, this causes an imbalance in cell division that also results in faulty distribution of chromosomes.” The polar body with the higher number of centrioles will also pull more chromosomes towards it; their correct distribution is no longer ensured. “Interestingly, we observe that cancer cells with chromosomal aberrations that are a result of too many centrioles survive and form part of the tumor mass,” Krämer said. By contrast, cells whose chromosomal defect is based on additional centrosomes often die. “This also sheds new light on tumor therapy”, the scientist added. More recent therapy approaches have attempted to prevent clustering of extra centrosomes in order to produce chaos in the chromosomal distribution and thus to prevent survival of the daughter cells. “If it proves true that the typical chromosomal aberrations in tumors arise through a different mechanism, we also need to search for new therapy approaches,” Krämer summed up. Caption: Cell division with surplus centrioles at both spindle poles. The upper panel is a light-microscopy image; the lower panel is an electron microscopy-based (FIB/SEM) 3D reconstruction of a mitotic cell. Use is free of charge. The German Cancer Research Center (Deutsches Krebsforschungszentrum, DKFZ) permits one-time use in the context of reporting about the topic covered in the press release. Images have to be cited as follows: “Source: Alwin Krämer/DKFZ”.